Immunoassay is a biochemical method that identifies and quantifies unknown analytes (protein, lipid, nucleic acid etc.) in solution (serum, urine etc.) using antibody-antigen reactions. There are many different formats and variations of an immunoassay, but the key point is still specific antibody-antigen recognition. What is an antigen and an antibody? Why can an antibody bind to an antigen? An antigen is a molecule that is recognized by the immune system, particularly by antibodies. Proteins, polysaccharides, pesticides, antibiotics, toxins, and hormones all can be antigens. But not all antigens can stimulate the immune system to generate antibodies. An antigen that can elicit an immune response, and particularly antibody synthesis is called an immunogen. Proteins with molecular weights higher than 5-10 kDa are immunogens, while small peptides, pesticides, antibiotics, or hormones are not. These low-molecular-weight substances are called haptens and must be chemically coupled to larger carrier molecules, such as bovine serum albumin or keyhole limpet hemocyanin, in order to elicit specific antibody formation. An antibody is a Y-shaped large protein (160 kDa) bearing two combining sites (paratopes) that bind to a limited surface (epitope) of the antigen specifically. Epitopes are mostly located on the hydrophilic part of the antigen, and their size is 10-15 amino acid residues that can be contiguous on the protein chain (linear epitope) or discontinuous yet spatially close on the protein chain. The antibody-antigen reaction is a typical reversible bimolecular reaction having rate constants for the forward and backward reactions that are dependent on the concentration of the antigen (Ag) and antibody (Ab), affinity for the antigen as defined by the association constant of the antibody for its antigen, temperature, pH, and other environmental conditions. Immunoassays are based on the binding and complex of an antigen to an antibody and people use some physical or chemical means to measure and quantify the antigen-antibody complex. Figure 1. Antigen and Antibody. (a) Small molecules can be recognized by antibody but cannot stimulate the immune system to produce antibody. They must combine with adjuvants (usually proteins) to form an immunogen. Proteins can always be an immunogen. (b) Antibody can recognize structural specific areas on antigen, which is called epitope. The recognition areas on the antibody are called paratopes. (c) An antibody is a Y-shaped molecular. 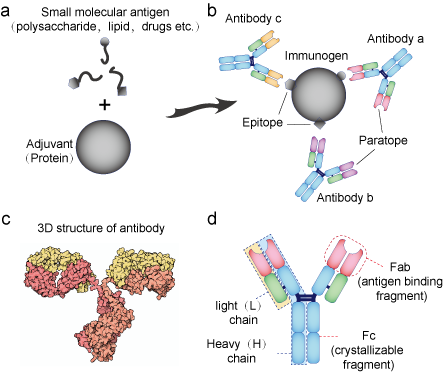 (d) An antibody consists of two heavy and two light chains linked by disulfide bonds. The Fab fragments of H and L chains are highly variable and the Fc fragments are conservative. A variety of methods have been developed for visualizing the primary Ag-Ab reaction. Precipitation of large cross-linked Ag-Ab complexes can be visible to the naked eyes without the use of labeled reagents for amplification. The precipitation reaction is a highly specific serological reaction involving the binding of antigen by antibody. Each antibody has two antigen binding sites and each antigen has multiple antigenic epitopes. When soluble antigens are bound by antibody to form a cross-linked “lattice” structure, the reaction is called precipitation. The precipitation reaction is inhibited when either antigen or antibody is present in great excess. The range of optimal concentrations at which the greatest amount of precipitation is generated is called the equivalent zone. 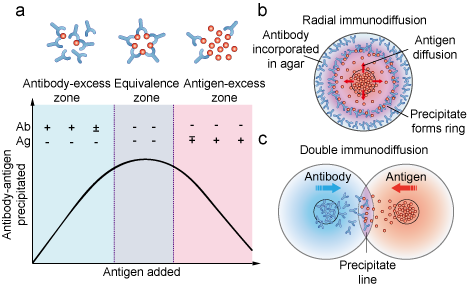 Based upon this principle, the presence of specific antigens in a mixture and the relative concentration of antigens can be detected by using antibodies. Figure 2. Immunodiffusion mechanism. (a) The amount of precipitation is affected by the concentration of antibody and antigen. (b) Schematic of radial immunodiffusion. (c) Schematic of double immunodiffusion. Two types of precipitation reactions can be used to determine relative concentrations of antibodies or antigens. They are radial immunodiffusion (the Mancini method) and double immunodiffusion (the Ouchterlony method). Both are carried out in a semisolid medium such as agar. In radial immunodiffusion, an antigen sample is placed in a well and allowed to diffuse into agar containing a suitable dilution of an antiserum. As the antigen diffuses into the agar, the region of equivalence is established and a ring of precipitation as well as a precipitin ring, form around the well (Figure 2b). The area of the precipitin ring is proportional to the concentration of antigen. By comparing the area of the precipitin ring with a standard curve (obtained by measuring the precipitin areas of known concentrations of the antigen), the concentration of the antigen sample can be determined. In the Ouchterlony method, both antigen and antibody diffuse radially from wells toward each other, thereby establishing a concentration gradient. As equivalence is reached, a visible line of precipitation forms (Figure 2c). Although useful, immunodiffusion and immunoelectrophoresis are tedious and time consuming, difficult to automate, and not easily applied to mass sample analysis. Immunoassays employ a variety of different labels to allow detection of antibodies and antigens. Labels are typically chemical-linked or conjugated to the desired antibody or antigen. RIA is an immunoassay that use radioactive isotopes (e.g. I-235) to label the antibody/antigen. It detects the radioactivity to measure the antibody-antigen compound with very high sensitivity. RIA were some of the earliest immunoassays developed, and fallen out of favor largely due to the difficulty and potential dangers presented by working with radioactivity. EIA is possibly one of the most popular used immunoassays. Instead of radioactive isotopes, EIA use enzymes (e.g. HRP, AP) as probes. These enzymes allow detection often because they produce an observable color change in the presence of certain reagents of substrate and chromogen (e.g. DAB, TMB) based on the enzymatic-reactions. FIA is analogous to RIA except that the label is a fluorophore (e.g. FITC, phycoerythrin) rather than a radioisotope. Fluorescence signal can be measured directly by detecting instrument. CLIA is a method to determine the concentration of samples according to the intensity of the luminescence that the chemical reaction emits. CLIA combines the CL systems and the immunoreactions. Some reagents have been used as CL labels. Upon the introduction of the CL substrates, the system produces chemiluminescence. So the samples can be detected quantitatively. The most popular CL substrates are luminol, isoluminol and their derivatives, acridinium ester derivative, peroxidase and alkaline phosphatase (ALP). ICA also known as lateral flow immunoassay is a rapid test immunoassay to detect the presence (or absence) of a target analyte in sample (matrix) without the need for specialized and costly equipment. In this kind of assay, capture antibodies are immobilized as a cross line on a porous hydrophilic materials. Analytes in buffer are then added on one side of the test stripe, driven by the lateral capillary force. The analytes flow through over the capture antibody line and captured by antibody. As the captured analytes accumulated, the complex could be revealed by the nanoparticle labels (usually colloidal gold) and viewed directly by naked eyes. Comparison of the five different labeled immunoassays above is listed in the following table. Each method has its own advantages and drawbacks, so we could chose the most appropriate means flexibly to optimize our test. 3. Enzyme/substrate reaction is short term and must be read soon. IHC combines histological, immunological and biochemical techniques for the identification of specific tissue components by means of a specific antigen/antibody reaction tagged with a visible label. IHC makes it possible to visualize the distribution and localization of specific cellular components within a cell or tissue. The most popular type of IHC are chromogenic and fluorescence detection mediated by an enzyme or a fluorophore, respectively, which basic principle are equal to EIA and FIA. While some kind of label is generally employed in immunoassays, there are certain kinds of assays which do not rely on labels. Instead, employ detection methods that don't require the modification or labeling the components of the assay. Surface plasma resonance (SPR) and quartz crystal microbalance (QCM) are two typical label free methodologies. Surface plasma resonance is the resonant oscillation of conduction electrons at the interface between a negative and positive permittivity material stimulated by incident light. It is essentially the mass of analyte bound to the substrate film of the sensor chip that changes the index of refraction that can be measured in various ways. No labeled reporter molecule is needed. Because the changes in SPR occur rapidly and can be monitored in real time, binding reaction kinetics can be studied. Quartz crystal microbalance based on the converse piezoelectric effect. The mass deposition on the electrode surface is proportional to the resonance frequency of the substrate crystal. If we immobilize capture antibody on the electrode surface of QCM chip and flow the analyte, the binding process of antibody and analyte could be measured by the detection of frequency change without any label of antibody or antigen. 1. Darwish I A. Immunoassay methods and their applications in pharmaceutical analysis: basic methodology and recent advances[J]. Int J Biomed Sci, 2006, 2: 217-235. 2. Levieux D. 11 Immunodiagnostic Technology and Its Applications[J]. Advances in Food Diagnostics, 2008: 211. 3. Brandon D L, Carter J M. Immunoassay[J]. Handbook of Food Safety Engineering, 2012: 279-312. 4. Ricchiuti V. IMMUNOASSAY-BASED TECHNOL-OGIES F OR THE MEASUREMENT OF BIOLOGICAL MATERIALS USED FOR BIOMARKERS DISCOVERY AND TRANSLATIONAL RESEARCH[J]. Biomarkers: In Medicine, Drug Discovery, and Environmental Health, 2010: 425. 5. Proll G, Ehni M. Immunoassays[J]. Handbook of Spectroscopy: Second, Enlarged Edition, 2014: 1313-1334.